Thirteen years ago, Sundos, a slight young woman wearing a headscarf, approached me in a cafeteria at the University of Jordan in Amman. She’d written an essay in English about what she did over the summer and asked me to review it before she handed it in to her teacher. When this young muhajiba approached me, a strange and foreign man, and asked for help, she crossed a cultural chasm. When I responded positively, I was transformed from a 27-year-old graduate student into an unofficial ambassador. I trace the origins of the America’s Unofficial Ambassadors initiative to that optimistic moment. 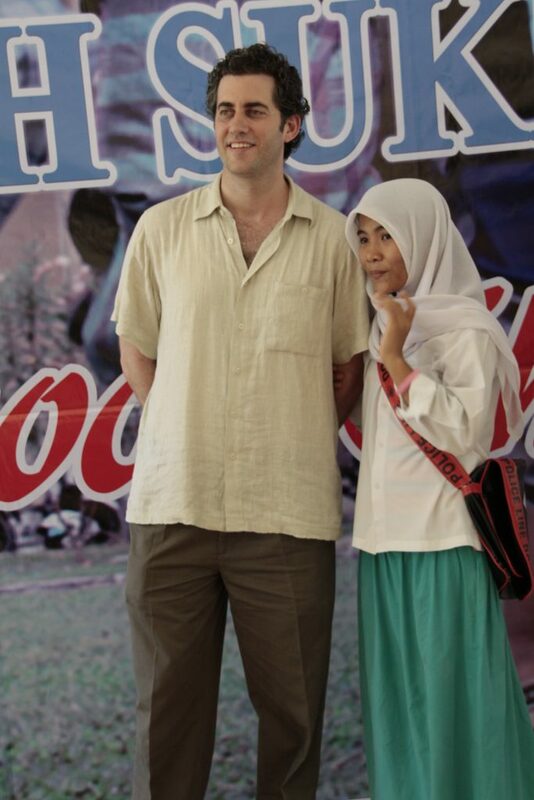 Ben Orbach with a student at Sukma Bangsa school in Aceh, Indonesia. America’s Unofficial Ambassadors is a citizen diplomacy initiative aimed at increasing the number of Americans who volunteer in areas of human development throughout the Muslim world. Over the past four years, we’ve sent close to 100 Americans from different faiths and backgrounds to volunteer, anywhere from a week to a year, in nine countries throughout Africa, Asia and the Middle East. 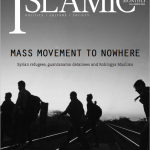 The premise behind our work is that each of us can make a difference in America’s multi-faceted and increasingly complicated relationship with the people of the Muslim world. Further, we can each participate in building mutual understanding by sharing our experiences at home, through blog posts, published essays and community presentations. By (our own) conservative estimate, we’ve reached 100,000 Americans with our mission. Upon reflection, I find my experience in Jordan and then in Egypt — I had to evacuate Jordan when the war in Iraq began — to be a surprising journey ground in persistent idealism, intellectual curiosity and good luck. Today, Jordan is a hub of expat activity, from international development workers to foreign students to employees of Fortune 500 firms. In 2002, I was just one of a handful of Americans at the university, and really in all of Amman. For decades, Cairo was a mecca for Arabic language students; in 2013-14, a paltry 37 American students studied abroad in Egypt. I backpacked through Syria by myself in 2002 — today the country is mired in a conflict with no end in sight. While much in these places has changed recently, my experiences were, for me, a building block to a career of creating partnerships between America and the Muslim world. On the morning of 9/11, I was headed to Arabic class when I found out about the attacks. I’d written my Master’s thesis on Osama bin Laden and al-Qaida that spring, but in the days after 9/11, I became transfixed with a need to know what regular people in Arab countries were saying about the attacks, bin Laden and the United States. I realized that I needed to speak Arabic well to find answers to my questions. That summer, I set off on a yearlong quest that led me to smoke-filled salons and open-air coffee shops. I engaged in what seemed like 1,001 discussions about U.S. foreign policy, the Jews (I’m one of them) and 9/11. Those debates were great for my language acquisition in that they were repetitive to the point of being scripted. I played the role of unofficial spokesman as I tried to dispel conspiracy theories and shed light on questions about the U.S. war with Iraq, my country’s intentions for the region and our visa process. The more interesting conversations, though, were the ones that went beyond the theater of these sessions and my flashcard-bolstered “talking points” on weapons of mass destruction. These other, one-on-one conversations, usually while sitting in a car or a similarly private but public place, were about the details of affording to marry, aspirations for an easier life somewhere else, and our culture that streamed across borders — we all loved Mariah Carey (except me). Salah, an Egyptian cook, taught me about the face of poverty in the absence of economic opportunity; I learned from Khulood, a Jordanian teacher, about the deficiencies of education systems that don’t foster critical thinking skills; and Fadi, a Palestinian refugee, gave me insight into the ins and outs of leading a second-class citizen’s life. These conversations weren’t characterized by “woe is me” hardship. Instead, I felt a lot of warmth and gained new insights into the concept of hospitality, the culture of family and being part of historic places and traditions. I often wondered if Egyptian or Jordanian visitors to the United States were treated as well as I was treated by my hosts. My year of persistent idealism in the face of harsh current events wasn’t an easy experience, but it was fulfilling, so much so that whenever I hear Arabic, I can’t help but smile. I don’t think there are a lot of Americans who feel that way today. Over the course of that year, I felt that it was useful to engage in respectful dialogue with people who had never met an American before. When I helped Sundos with her English homework and later taught her to use a computer, I knew that I was doing something worthwhile. I was helping her to achieve something she wanted by teaching her an important skill set. My efforts were their own reward, but they also contributed to a larger vision we shared for the future. In answering that second question, a three-fold problem troubled me. First, there are societal challenges that people face in communities across the Middle East, Africa and Asia, whether that is attaining a quality education or landing a job that offers a path to dignity. For the most part, local resources will not meet these challenges, and external resources, such as foreign assistance, are not forthcoming. Second, people in these countries think they know America because of our entertainment industry or our foreign policy choices, but they actually have never met an American; there is little in-person interaction. That absence of exchange is a breeding ground for demonization. And third, I found a similar reservoir of ignorance about the Middle East and Islam among my fellow Americans; Muslims were flag burners, angry young men and misogynists, not happy, sad and complicated individuals like us. Years later, we are addressing these three challenges with America’s Unofficial Ambassadors. Each of our unofficial ambassadors — from university students to elementary-school teachers — commits to achieving three things: to have an impact by supporting a hand-picked school or local organization in implementing its mission; to dispel stereotypes of Americans by engaging in respectful cultural diplomacy; and to build mutual understanding at home by sharing his or her experiences. Over the past four years, the majority of our unofficial ambassadors have been 18- to 24-year-olds. They have volunteered in a number of ways, from teaching French in a shepherding village in Morocco, to designing a website for the only autism nongovernmental organization in Tajikistan, to training domestic abuse counselors in art therapy in Indonesia. Our young volunteers have turned out to be the demographic that not only has the most time and money to contribute, but also possesses that requisite idealism and intellectual curiosity to make a difference. Most of our unofficial ambassadors fall into one of two categories: “aspiring activists” out to make a difference on specific issues, or “accidental advocates” who come from the cluster of worldwide do-gooders interested in helping others while enjoying their own adventure. 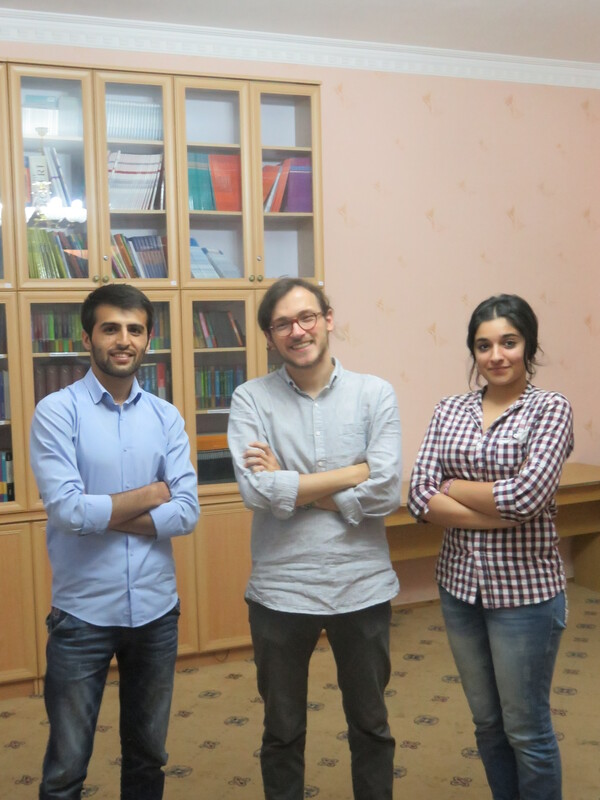 For example, in the summer of 2015, Rob Handerhan, a senior at The College of New Jersey, volunteered as an English teacher at a cultural center in Tajikistan. Rob taught eight classes every week. While he isn’t a professional teacher, his students, from teenagers to Ministry of Justice employees, gained from the enthusiasm he brought to the classroom. He did things that were different from the norm, like using Beyoncé’s If I Were a Boy to teach the second conditional (i.e. “If I won a million dollars, I would …”). Rob with two intermediate students at Bactria. Rob, an “aspiring activist,” served as an unofficial ambassador in part because he cares about countering Islamophobia. A history major with an interest in the Islamic world, he took being a citizen diplomat seriously, striving to speak Farsi and ready with a smile, hello or a handshake at all times. After returning home, he presented his experience at Busboys and Poets, a popular restaurant in Washington, D.C., and on campus to social science and language classes. 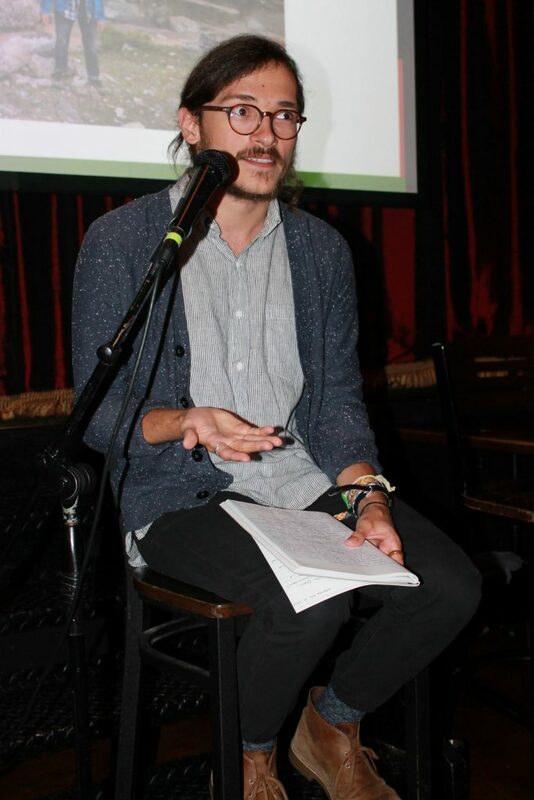 Rob presenting at Busboys and Poets. Rob may choose any number of career paths when he graduates. If he works on these issues professionally, the experience he gained as an unofficial ambassador will serve as a professional building block. Rob may one day write a book on the role that the arts can play in combating Islamophobia and may become a thought-leader on these issues. Katrina Marks, a senior at Villanova University, was another of our summer 2015 unofficial ambassadors. 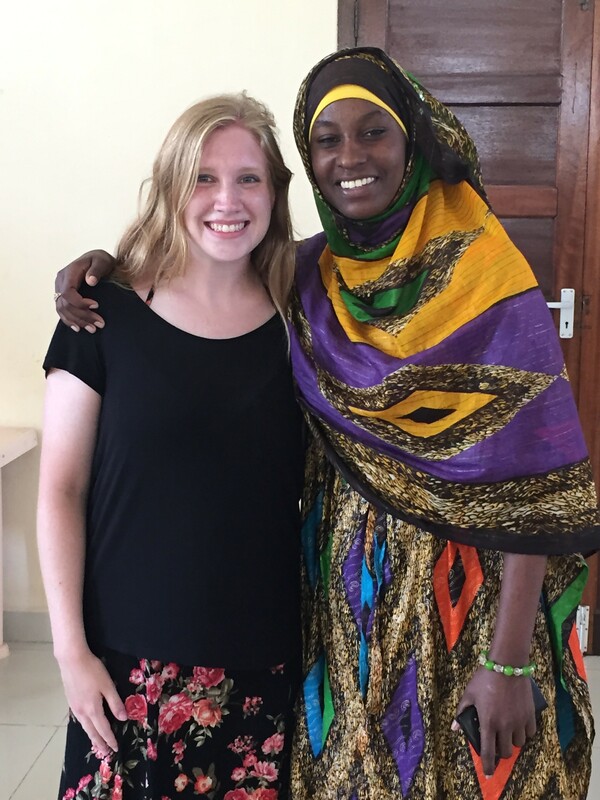 She volunteered in Zanzibar with the Forum for African Women Educationalists, an NGO that supports the empowerment of women and girls through training courses and advocacy. Katrina researched and wrote elements of funding proposals, developed content for FAWE’s social media, managed their Web-based platforms and participated in workshops on sexual harassment and science, technology, engineering and math programming. Katrina is interested in oral history and the study of collective memory, so after work, she would regularly visit Zanzibar’s Old Slave Market. She studied how local tour guides explained the history of the island’s slave trade and she gathered research for her senior thesis. Katrina at FAWE with a colleague. When she returned home to Kent City, Michigan, a town of 1,100 people, Katrina gave a presentation about her experience to the Historical Society, a group of seniors, most of whom attended the same Lutheran church that Katrina’s family has attended for nine generations. The presentation wasn’t about, “What I did last summer … with the Muslims.” Rather, Katrina spoke about an exotic and less-understood place where she worked with the local community to empower young women and lived in a foreign culture that challenged her to consider new ideas — like whether it was more respectful (or less) for her to wear the hijab. Katrina may have traveled to Zanzibar looking for answers for herself, but she became an advocate for tolerance in the process. Because of her local roots, she was able to reach an audience that we never could have connected with from Washington, D.C. With her presentation, she framed her experience in a Muslim community into the common story of cross-cultural engagement in a foreign land, one that a World War II veteran in the audience identified with as being similar to his own experience overseas. These polls suggest the familiarity gap is widening. More than 300,000 American students studied abroad in 2013-14, but just 2.4% of them studied in a Muslim-majority country, according to the Institute of International Education. It is telling how few young Americans are developing networks and having experiences in parts of the Middle East, Africa and Asia that will enable them to, at a minimum, correct hate speech from their own personal experience, if not serve as an agent of larger change. While I personally identify with “aspiring activists,” our need for more “accidental advocates” is striking. The basic conclusion from any positive cross-cultural interaction is that while each of us has different pieces of culture to offer the world, we are all the same, regardless of race, ethnicity, religion or citizenship. Reaching that basic conclusion, though, requires either first-hand experience or the trust to believe someone who shares one’s experience, like Katrina at the Kent City Historical Society. 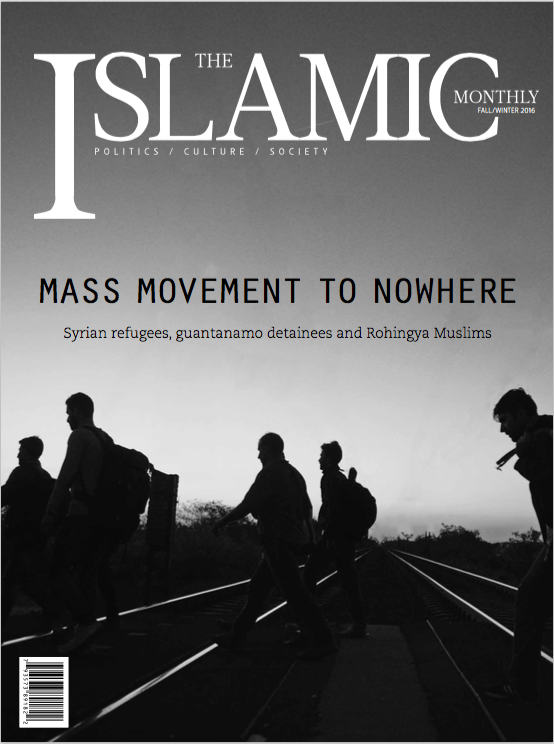 This article appears in the Winter 2015 print issue of The Islamic Monthly. 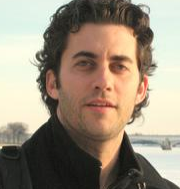 Benjamin Orbach is the Founding Director of America’s Unofficial Ambassadors at Creative Learning, a Washington, D.C.-based not-for-profit organization.